Valencia container traffic grows. A result of COSCO entry? The Valencia Port Authority reports its container throughput of the first 10 months of 2017 at the level of 4,043,251 TEU, which represents an increase of 1.73% y-o-y. The most part of it was handled by Valencia – 3,999,016 TEU, whereas the remaining volumes come from the smaller ports that fall within the Port Authority, i.e. Sagunto (44,229 TEU) and Gandía (6 TEU). According to the Port Authority, the increase in traffic was achieved by the good performance of full import and export containers, as well as transit. Thus, full exports rose by 6.61% (752,265 TEU) and full imports increased by 5.34% (552,151 TEU). Transhipment volumes rose by 5.16%, up to 2,214,153 TEU, making up almost 55% of the port’s container throughput and confirming Valencia as one of the major European transit hubs. Empty volumes dropped by 21%, to 524,682 TEU. 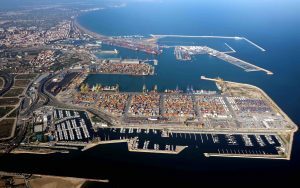 According to the Spanish media, the positive results of Valencia container traffic may be attributed to the recent acquisition of Noatum Ports, the owner of the main container terminal in Valencia port, by COSCO Shipping Ports in June and the change in its management team that followed in October. Indeed, whether it is a coincidence or not, the upward trend is obvious in the port’s statistics. The container traffic, slowly declining for the first 6 months in 2017, suddenly showed a 0.34% growth in July (2,748,293 TEU) and kept growing onwards until today’s 1.73% rise. The experts see it as a signal that COSCO Shipping indeed moves more of its vessels to be handled at Noatum Valencia. Port sources predict that the Chinese shipping line will use Valencia as a transshipment hub for its operations in the western Mediterranean region, adding 200,000 TEU to the port’s container throughput in 2018 and bringing it to the long-desired figure of 5 mln TEU. Well, time will show. Valencia’s closest container rival, the port of Algeciras, handled 3.5 mln TEU in January-October 2017, posting an outstanding 10.9% drop, an obvious result of the dockworkers strikes that had been causing disruptions in the port operations and vessel diversions during the past spring. The decline was caused by the 12% decrease in international transhipment volumes, which generate 80% of Algeciras’ throughput. On the contrary, a tremendous surge in transhipment traffic was recorded in Barcelona’s throughput: +131.1%, up to 878,717 TEU from 380,288 TEU in 10 months 2016. This has helped the port reach a dashing result by now: 2.47 mln TEU, +31.1% to January-October 2016. This is already 10% higher than the port’s total container volume in the whole last year (2.24 mln TEU), when Barcelona recorded the largest growth in the last decade, +14.5%.